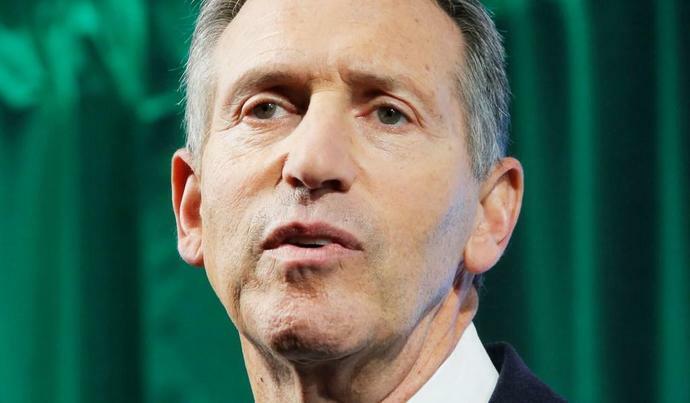 Former Starbucks CEO Howard Schultz conceded Wednesday that he is surprised by the extreme Democratic backlash against his recently-floated independent presidential run, but suggested the outsized attention may ultimately help get his message out. "I must be doing something right to create so much interest and backlash from the Democratic Party. Some of it is a surprise, but we expected to see some of the level of vitriol but not the extent it's been," Schultz said during an appearance on MSNBC's "Morning Joe." Prominent Democrats across the political spectrum have lashed out against Schultz since he suggested he might run for president as an independent Sunday, predicting the billionaire businessman will facilitate Trump's reelection by drawing votes from the Democratic nominee. "[Schultz] can't win, and he could seriously damage our ability to beat Donald Trump. He should either run as a Democrat, or spend his time and money doing something that won't ruin the world," President Obama's 2012 campaign manager Jim Messina told Axios. Former Clinton adviser Phillipe Reines echoed Messina's comments, calling Schultz "a jackass" in his comments to Axios. "He's arrogant and wealthy - and those people tend to not see the world as it is," Reines said. Schultz defended his decision to run as "centrist independent" and directly responded to Messina's criticism Wednesday, arguing the legislative gridlock of recent years indicates the two party system is no longer viable. "I don't affiliate myself with the Democratic party, who's so far left they basically want the government to take over health care, which we cannot afford, the government to give free college to everybody, and the government to give everyone a job, which basically is $40 trillion on a balance sheet of $21 and a half trillion," Schultz said. "What we need is comprehensive tax reform, what we need is sensible solutions to immigration. All of these things cannot happen under the current system." Schultz harshly criticized Senator Elizabeth Warren's (D., Calif.) deeply progressive presidential platform, calling the idea of funding "Medicare For All," tuition-free higher education and a tax on the ultra-wealthy "ridiculous." "Free Medicare for all, government-paid, free college for all - first of all, there's no free. I mean nothing is free," Schultz said during a Tuesday interview on NPR. "What's 'ridiculous' is billionaires who think they can buy the presidency to keep the system rigged for themselves while opportunity slips away for everyone else," Warren tweeted in response. UnitedHealth (NYSE:UNH) delivered a perfect score Tuesday releasing Q1 2019 earnings that ticked all the boxes. If you're a shareholder of UnitedHealth or other healthcare stocks selling healthcare plans, you've got to be worried that Bernie Sanders or one of the other Democratic candidates proposing a universal health care plan gets into office. Howard Schultz, who's against the proposal, recently had this to say about the idea of "Medicare-for-All".